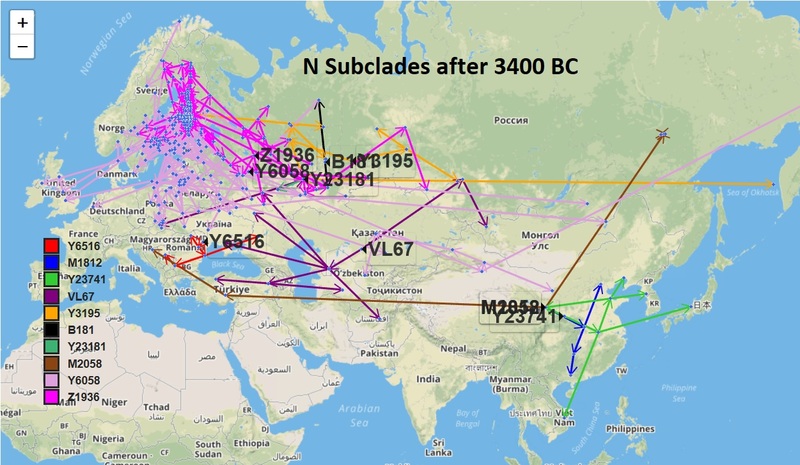 By 3400 BC, there were 10 major subclades of N, stretching from Russia to East Asia. Theoretical computed origins of ten major N subclades which formed after 3400 BC. Note the two subclades with greatest diversity in the Baltic are Y6058 (pink) and Z1936 (magenta). They are the two child lineages of L1026 whose migration from Asia is pictured below. While the majority of these lineages are in Central Europe and Russia, the progenitor of haplogroup N likely lived as far east as China during the bottleneck from 37,000 to 22,000 years ago. This article will not address the evidence for the origin of N or the subsequent migration across Central Asia but will instead focus on the path and timing of N migrations through Russia to Finland and the Baltic. Two subclades of Russian L1026 form the bulk of Baltic N, Z1925 and VL29. Both started diversifying in Finland in the Late Bronze Age, in 1600 and 1000 BC respectively. Two child lineages of Russian L1026 form the bulk of Baltic N diversity. These lineages split in 2800 BC and sired some lineages which stayed in Russia while others went to the Baltic by a NW route. Z1925 appears to have travelled a more northerly route around Lake Onega, while VL29 migrated directly from the direction of Moscow. Both appear to have lineages which began diversifying in Finland and/or Norrbotten County, Sweden between 1600-1000 BC. The theoretical migration of N to the Baltic as computed by PhyloGeographer differs in several ways from the Eupedia map from 2017. 1) PhyloGeographer has a more northern route, bypassing Estonia and only entering Estonia later from Finland. This conforms to linguistic theory of Northern and Southern Estonian languages having entered Estonia through separate waves of Finnic speakers. 2) PhyloGeographer has a later date for the entry of N to the Baltic with 1600 BC for VL29 and 1000 BC for Z1925. However in each case their ancestors could have been there as early as 2100 BC and 1300 BC if the first man of each bottleneck undertook the migration. Maciamo implies that L1026 were associated with Kiukainen culture but the TMRCAs of these first N in Finland more likely means they ended that culture. This also makes sense because their migration path has them coming from the Fatyanovo-Bolanovo cultural zone, an eastern offshoot of Corded Ware which exploited copper. Z1936 and child Z1934 have TMRCA 2300 BC and both are computed to have lived in Yaroslav. 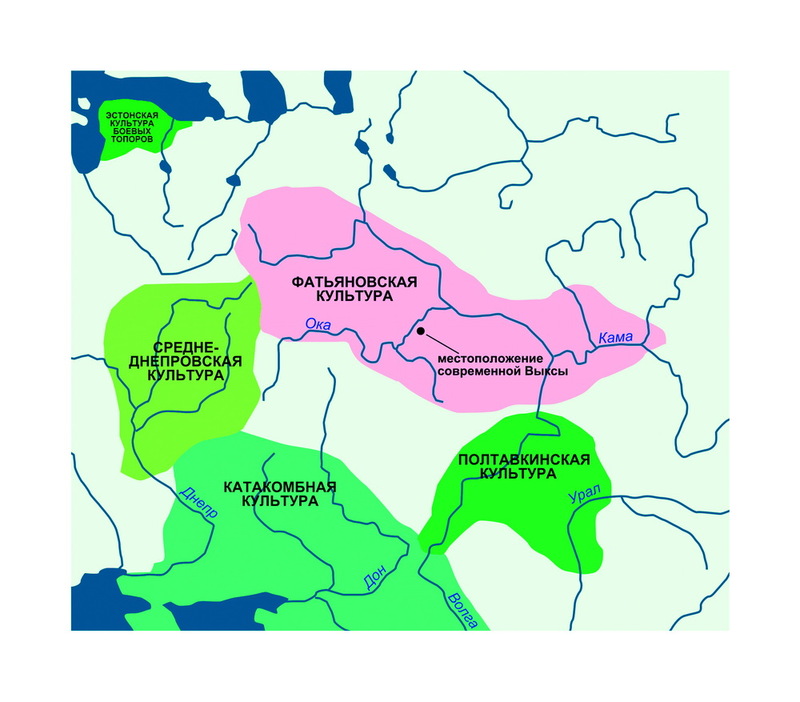 By 1300 BC child Z1928 diversified further NW, east of Lake Onega. Z1925 with greater diversity in Central Finland and Northern, non-coastal Finland. By 1000 BC, Z1925 is the first of these lineages to diversify in Finland. Note the lack of migration paths to Estonia and only limited migration outside of Finland to Russia and Sweden. Perhaps the expansion of this lineage to the south and western coasts was checked by the dominance of their kinsmen VL29 who may have gotten there first. So they stayed inland and went to the mountainous north. We will examine sibling VL29 next, starting with its parent CTS10760. Y6058 is computed to have lived near Moscow, in the same place as its parent L1026. Its child lineage, CTS10760 migrated further NW over the next 700 years. The child lineage of CTS10760 named VL29 then migrated to Finland, whose diversification is shown below. 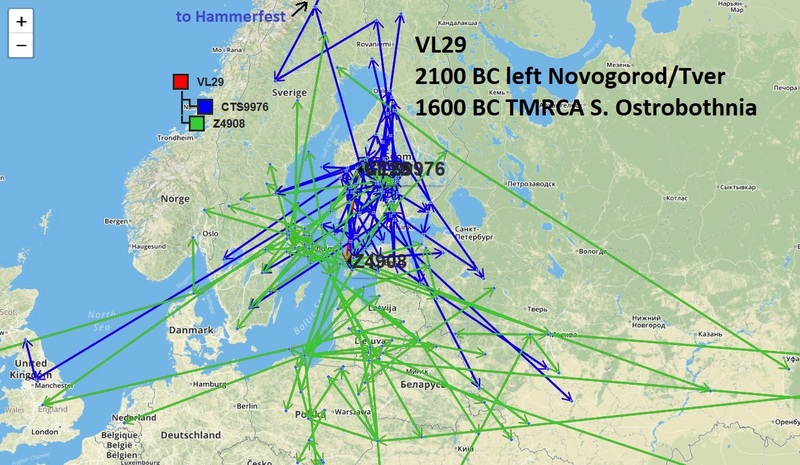 VL29 is the earliest diversification of N in the Baltic at 1600 BC. Child lineage CTS9976 (blue) with greater diversity in Finland and Z4908 (green) with greater diversity in Sweden and the South Baltic. The earliest reliable presence of Y6058 in Finland is 1600 BC when it appears child lineage VL29 diversified in Ostrobothnia. 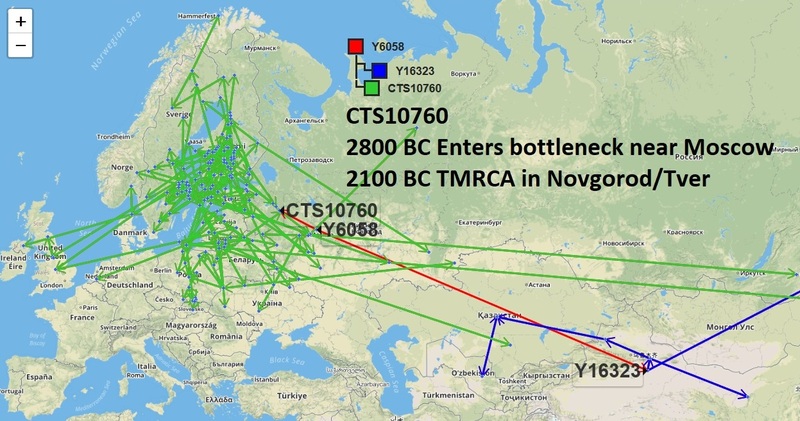 But the lineage could have entered anytime after 2100 BC when the bottleneck started in Novgorod/Tver. 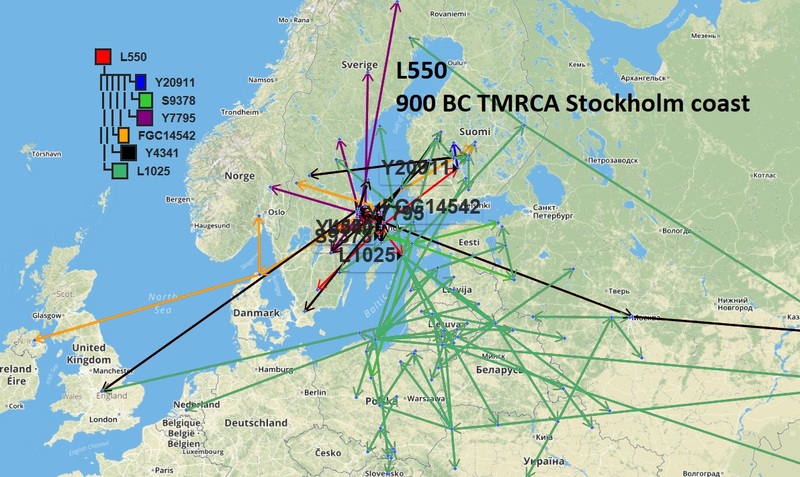 This man sired two lineages, CTS9976 (blue) with greater diversity in Finland and Z4908 (green) which first diversified around Stockholm, Sweden and went on to establish subclades all over the Baltic, except in central and northern Finland and Pomerania. L550, main subclade of Finnish Z4908 appears to have diversified between Stockholm, Estonia and Southern Finland in 900 BC. Its child L1025 became prolific in the South Baltic. In a separate article I address the migrations of L550's child L1025, which may have been associated with the Nordic Bronze Age or the Baltic cultures it subsequently settled amongst. L1025 underwent major diversification throughout the Baltic and Gulf of Bothnia but especially in Latvia, Lithuania, Belarus and Poland in 600 BC. The genetic circumstantial evidence for the earliest presence in Finland of Haplogroup N corresponds in time to the end of the Kiukainen culture, 1500-1300 BC. This was the last Stone Age culture of the region. 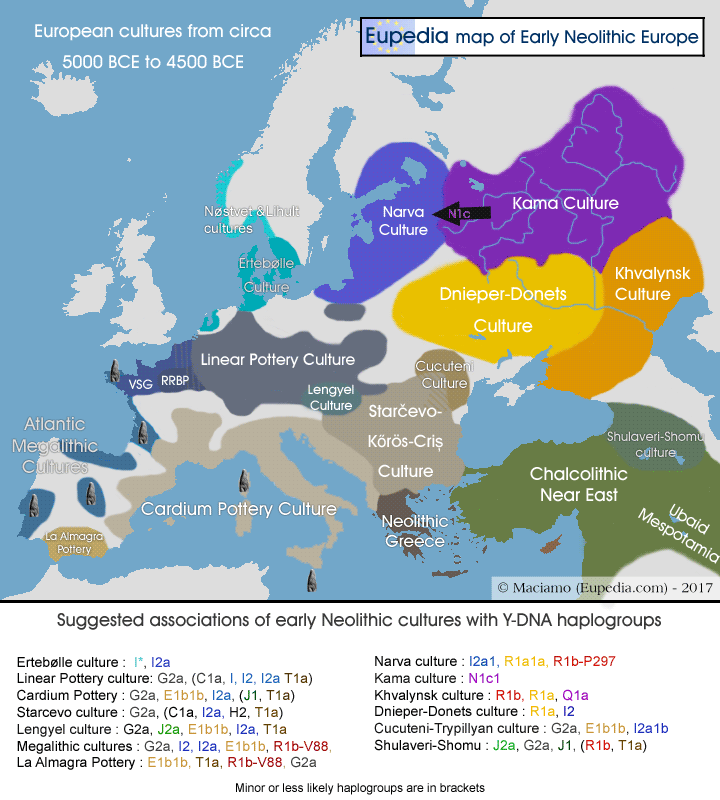 The association with Haplogroup N and Uralic languages has long been discussed. Complicating the picture are deep interrelationships between Uralic and Turkic groups. In this article I examine the circumstantial evidence only from some of the samples on YFull below M2019, the sibling of L1026 and the only N subclade on YFull with Hungarian samples. ← Did N-Y7310 Arrive in the Pontic Steppe with the Mongols or Was it Already There?